Magnuson Hotels, the world’s largest independent hotel group, announced today the complete rebranding of a Marietta, OH Best Western as Magnuson Hotel By The River. Formerly a Best Western of 32 years, the 47-room hotel sought to upgrade its local, regional and national market position with the Magnuson Hotels brand designation. 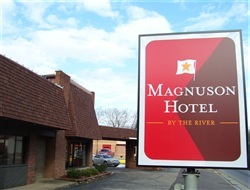 Corporate, educational, government and leisure travelers will enjoy the Magnuson Hotel By The River located just minutes from Marietta’s historical areas, Marietta Memorial Hospital, Marietta College, Indian Acres Park, Campus Martius Museum, the Ohio River Museum, and Washington County Fairgrounds. Guests will enjoy continental breakfast each morning, free wireless Internet and parking with convenient access to area golf courses, the Marietta Aquatic Center and YMCA for swimming and exercise facilities. The Magnuson Hotel By The River will receive total brand representation across North America and the UK, without the costs and requirements of franchise brand affiliation. In contrast to traditional hotel chains that charge a percentage of total hotel revenue, the Magnuson Hotel By The River will increase its net income with higher market exposure at a lower cost. Direct revenue to the hotel is non-commissionable and royalty free. The Magnuson Hotel By The River is backed by the quality standards of the world’s largest independent hotel group. The hotel will also receive a 10% brand rebate, paid every six months.